A University of Central Florida research team has created the world’s shortest laser pulse and in the process may have given scientists a new tool to watch quantum mechanics in action – something that has been hidden from view until now. 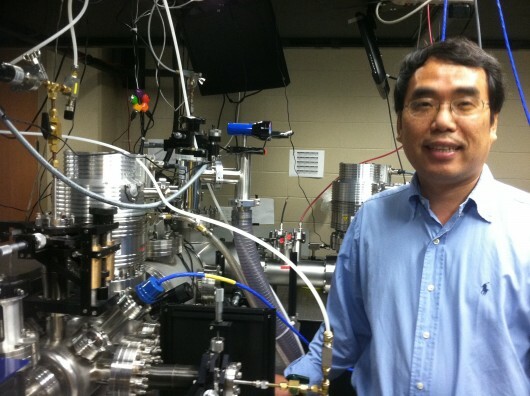 UCF Professor Zenghu Chang from the Department of Physics and the College of Optics and Photonics, led the effort that generated a 67-attosecond pulse of extreme ultraviolet light. The results of his research are published online under Early Posting in the journal Optics Letters. An attosecond is an incomprehensible quintillionith of a second. In other words it would take 15 million billion pulses of the size Chang’s team achieved to equal one second. The accomplishment is even more remarkable because the team did it without the use of specialized equipment including a mile-long particle accelerator or a Superdome-sized synchrotron. Quantum mechanics is the study of physics at the microscopic level, specifically looking at energy and matter on this miniscule scale. There is much excitement about the accomplishment and the promise Chang’s work holds for helping scientists understand how the world’s smallest building blocks actually work. The technique could lead scientists to understand how energy can be harnessed to transport data, deliver targeted cancer therapies or diagnose disease. The finding marks the first significant breakthrough in the laser pulse field in four years. In 2001, attosecond pulses were demonstrated for the first time. Since then scientists around the world have been trying to make ever-shorter pulse durations because of the door they could open to understanding the subatomic world. The previous record of an 80-attosecond pulse was set in 2008 at the Max Planck Institute in Garching, Germany. This is the first time an American-led team has set the record. Chang’s team was able to accomplish the work at the Florida Atto Science &Technology (FAST) lab in UCF’s Physical Sciences building. Using the unprecedented power of laser light enables Chang and his peers to conduct their high-level research in much smaller spaces. Chang’s group created a technique called Double Optical Grating that allows extreme ultraviolet light to be cut off in a manner that concentrates the maximum amount of energy in the shortest possible pulse of light. With the affinity for acronyms shared by many ultrafast laser physicists, Chang named the technique DOG. In addition to creating the light pulse, he created an even faster camera to measure it, which is the Phase Retrieval by Omega Oscillation Filtering (PROOF). The Department of Defense’s Multidisciplinary University Research Initiative and the National Science Foundation helped fund the research. Others who contributed to the team’s discovery include: Kun Zhao, Qi Zhang, Michael Chini, Yi Wu, and Xiaowei Wang, all at UCF.